Interview with James m. O'brien, ph.d. Hang Your Wraps in the Cloak Room! Article first published as Interview: James M. O’Brien, Ph.D., Author of ‘Hang Your Wraps in the Cloak Room!’ on Blogcritics. James O’Brien graduated Notre Dame, served as a parish priest, high school teacher, editor, and Director for Media in the Rockford, IL Diocese. Earning a Ph.D. from Northwestern in Communication Studies, he taught at the University of Miami and The College of New Rochelle, retiring as Professor Emeritus. Dr. O’Brien offers film courses through the University of Wisconsin PLATO program, and has committed two previous memoirs. Sheri: Welcome James, and thank you for joining us today! Why don’t you start by telling our readers a bit about yourself? James: When I retired, I got into a Reminiscence Writing class, people seemed to like my stuff, and I began to write stories from my exotic seminary years, which eventually turned into Making a Priest in the Fifties, my first of three memoirs. I love to write, but I hate to edit. Sometimes my wife helps with that. I love to play the clarinet, but I hate to practice. Maybe there’s a pattern there. Sheri: What is Hang Your Wraps in the Cloak Room! about? James: Simply, my grade school and high school years, during and after World War II, and how that strict and structured world got inside me, without my knowing it was happening. I’m not a very structured guy and maybe, without knowing it, I was looking for some life rules. The war haunted my early years and, by the time we began to feel a bit of freedom and hope, the Cold War, with the ‘Communist menace’ of McCarthyism, and the Korean War with the threat of being drafted continued to hang over our lives. But it seemed normal, I guess. James: As the high school section should reveal, our tiny class of fifty students was bonded to an unusual degree, by a series of experiences: social structure, racial discrimination, sexual strictures. We held class reunions every year for our first ten years - the college kids and the working kids - and we still meet for lunches and reunion overnights a couple of times a year. Classmates travel for thousands of miles for these parties. Something happened to us, without anyone planning it. I hope, among other things, my memoir celebrates that. Sheri: I understand you have written two previous memoirs. Do they each cover specific periods of your life? What sets Hang Your Wraps in the Cloak Room! apart from your other memoirs? 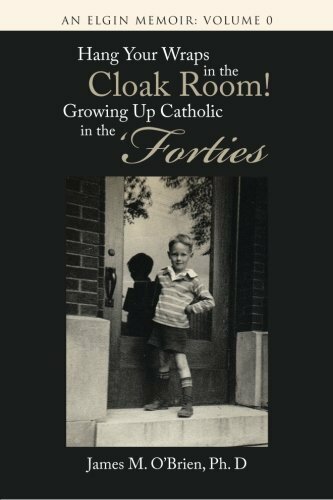 James: Making a Priest in the ‘Fifties: or How Your Elderly Pastor Got That Way recounts my four years at St. Mary’s Theological Seminary in Baltimore, MD. As the subtitle might indicate, the tone is light although the concerns are serious. All but one other of my 135 classmates had spent seminary time, two to six years. I was clueless about the operation and dynamics of the institution, but the faculty made allowances for that and gave me enough leeway to….well, get through. Confessions of a ‘Sixties Priest: But Probably Not What You’re Thinking examines my eight years of priestly ministry in the rural Rockford, Illinois Diocese. It was an exciting time in the American church and, as a passionate believer in all the ‘new stuff,’ I plunged into every involvement I could find. When the Church made an ideological turn to the right at the end of the ‘Sixties, I had nowhere to go but out. John XXIII opened the window to the world and I crawled out. Sheri: Can you give us a glimpse into one of your favorite memories from Catholic School that’s in the book? James: A key moment came in seventh grade when the nuns named me Master of Ceremonies for the class breakfast. Small and shy, I spoke into a big RCA microphone to the parents and students, and this big voice came out. I got laughs. I loved it. Sheri: What is the most rewarding part about writing a memoir? James: A couple of things. First of all, when I hear from readers and they tell me that they recognize the situations and experiences, it means that I have caught something real, maybe important to someone. Also, I’ve learned a lot about myself, who I am, why I followed the path that I did. But I’m still learning. Sheri: What was your biggest challenge writing Hang Your Wraps in the Cloak Room! James: After about two years of writing and some 50,000 words, I ‘hit the wall.’ I didn’t know where I was going with the book. After another two years, and a note from a college classmate praising a previous memoir, I said, “Hey, I can do this.” And I guess I did. James: A colleague here in Madison said, “If you want to find a publisher, you’ll need an agent, and that may take you a couple of years. Then, if you get a contract and sign it, it’s no longer your book.” This seemed clear and practical. So I went the self-publishing way. There are problems with it, but all in all, the publisher and the writer are on the same side. James: Absolutely standard stuff: write what you know; try to get at the truth; find your voice. James: If there is a time in your life that is special and vivid to you, try to write it down. And try to find a group of writers to read to. Reading your stuff aloud quickly reveals the live stuff from the dead material. It’s not always easy. James: I play clarinet in a jazz band; been with them for sixteen years now. We’re going to quit when we get it right. Hasn’t happened yet. Coordinate a couple of film courses for UW Extension PLATO program. Work in the garden; shovel snow, standard stuff. I’m real good at dithering. Sheri: Do you have a website or blog (or both) where readers can learn more about you and Hang Your Wraps in the Cloak Room? Sheri: James, thank you so much for joining us! I really enjoyed getting to know more about you and your work, and I wish you the best of luck in your future endeavors! James: I enjoyed the questions, Sheri, and had to grapple with a few of them. Oh, and people call me “Jim,” unless I’ve done something bad. Read review of Hang Your Wraps in the Cloak Room!